"It's absolutely wrong to talk with children about their experiences in war. Children's minds are ready to replace negative emotions with positive ones. then ignite their imagination with ideas of goodness, meaning and beauty." These days, there's so much talk of Post-Traumatic Stress Disorder (PTSD), a term used to describe severe psychological disabilities, especially those resulting from war. Children are particularly vulnerable to such traumatic experiences. Zara Imayeva makes no claims of having studied PTSD either clinically or academically, but she's convinced that many psychiatrists and psychologists are wrong in their approach about treating children who have suffered through such experiences. So often, these "experts" require children to focus on the trauma, which, according to her, just causes them to relive the horror and pain. Zara is convinced that healing is much more rapid when the mind can focus on positive things - not negative ones. A professional journalist, Zara, 42, arrived at these conclusions from her own experiences and from being involved these last three years in a group that she helped to create - the Didi Art Therapy Studio in Baku, which involves 30 to 40 children. For Zara, war is not an abstraction. She lived through the trauma of war in Chechnya, twice having fled her mountain village near Grozny. In the process, she lost her husband and was left, alone - jobless and homeless - to care for their young son. Recovery has been a painful process for Zara. Curiously her own well-being has been intricately linked with her efforts to help children erase the trauma of war through the therapeutic use of drama. Zara tells her story here. People respond to trauma in very different ways. Some go on living what appears to be quite normal lives. They don't stop creating or planning. But in my situation, what I experienced in Chechnya was so rehabilitating that I had no desire to go on. I didn't want to live. I had lost everything - my home, my husband, friends. I had no desire for anything. Absolutely nothing - no joy, no travel, no love. At night, I would lay my head down on the pillow simply because it was dark. In the morning, I would crawl out of bed simply because that's what you do when it's light. But it seemed so useless to live such a purposeless life or to think about making any plans for the future. I'll never forget the time, when about 30 or 40 of us had gathered in the basement of what used to be the KGB building in hopes of finding refuge from the bombing raids in Chechnya. In between the attacks, the children would run out into the courtyard to play. They had grown so accustomed to the sound of the engines of the planes that they could discern between planes that were a threat to us and those which weren't. The children would yell out: "Don't be afraid of this one. It's already dropped its load on other parts of the city. They won't bomb us." That's how children in the midst of their play could respond to that situation; but me, even to this day, whenever a plane passes overhead - even a passenger plane - my knees start to shake. Didi was created in 2004 with the idea to provide psychological rehabilitation for refugee children from Chechnya. We call it "Didi" which means "baby" in the Chechen language. But in the broader sense of the word, "Didi" refers to a person who is still child-like: full of dreams, wishes and imagination. We believe that these children should not be denied the joy of childhood. It needs to be given back to them. 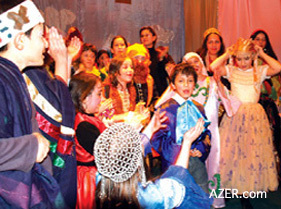 Above left: The Children's theater, located behind Azerbaijan Drama Theater, is designed to offer a very intimate experience for both the performers and theater goers. Small in size, it accommodates only about 50-60 people. The stage is surrounded on three sides with tiered seats. Here, the Swiss consul enjoys the program featuring Heidi. The Swiss Consulate has helped to sponsor the efforts of Didi Art Therapy Studio. Above right: Main characters in the play about Heidi, who is shown wearing a yellow dress. The main aim of the Didi Art Therapy Group is to help children to be able to imagine and dream and wish again. Only then will they become mentally strong and healthy individuals and recognize their own human dignity. Above left: Tarlan Gorchu, talented artist in Baku whose family has played an integral role in the establishment of Didi Art Therapy Studio. Above right: Gypsy dancers in Heidi. Our group has grown to 30-40 children now. 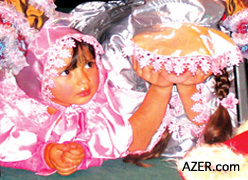 They come from various nationalities: Chechens, Turks, Azerbaijanis and Americans. Some of them have been fortunate to have normal childhoods, surrounded by loving parents, homes, friends, warmth and peace in their country. Others have experienced the trauma of war first hand. Sometimes their parents or close relatives were killed, and everything that they used to associate with home has vanished. They now live in a foreign country where everything is different and unfamiliar. The main thing I've learned from these years of working so closely with children in drama therapy is that one should never toy with the feelings and emotions of children, no matter if you have the best of intentions. Children who have experienced war and who have undergone serious psychological stress should have their childhood returned to them. Childhood means playing - playing games that are joyful and merry, that makes one dream and imagine. It's absolutely wrong to talk with children about their experiences in war. Children's minds are ready to replace negative emotions with positive ones. If you want to help children forget the trauma of war and other stressful conditions, then ignite their imagination with ideas of goodness, meaning and beauty. Through creativity, children learn independence. They learn how to control their bodies and how to use the intonation of their voices. This brings enormous personal satisfaction. We want children to learn tolerance. 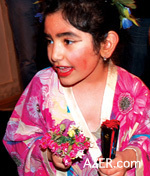 Through drama, children are introduced, both consciously and subconsciously, to other cultures. 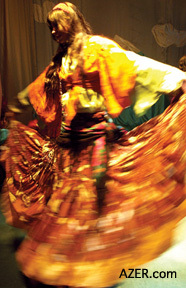 We want them to become multicultural and so together we learn Chechen dances, Norwegian songs. 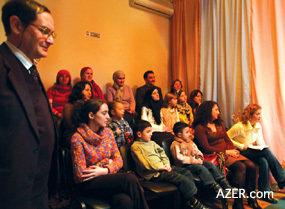 We celebrate Azerbaijani holidays and perform tales from many countries. a major feature in Didi presentations, (right) A scene of Leprachans in Heidi. We choose our repertoire with care and deliberation. It's not easy to select stories that will attract the interest of children whose ages range from 3 to 14 years. But we do follow certain criteria. We avoid stories that would exclude our children, such as the typical story of a prince falling in love with a princess. We also stay away from horror stories about mythical animals. And we absolutely forbid any story that would require the use of guns or any weapon on stage as a prop. Currently, we've been working on two major pieces: a story about a Swiss girl called Heidi and "Le Petit Prince" (Little Prince) by the French writer St. Exupery. Both works are more than an hour in length and we try to involve as many children as possible in each production. For example, we scripted five sets of characters for Little Prince. There were five princes, five pilots, five kings, five sheep, five foxes and five roses. 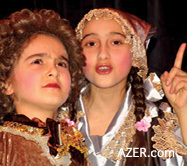 We feature a Chechen Little Prince, as well as Azeri, Russian, British and French Little Princes, too. Some scenes are even in English and French. I love "Little Prince". This work has had a profound effect upon me at different stages of my life. I hope the children will come to love it, too. I first became acquainted with it as a teenager. I was 14 or 15 at the time and I found it very boring.The next time I read it, I found it very sad. Obviously, my perception of the story has changed over the years to parallel my own life experiences. Above: The latest additions to the repertoire of Didi Art Therapy Studio for Children in Baku include "Little Prince" by French writer St. Exupery and "Heidi", a little Swiss girl. 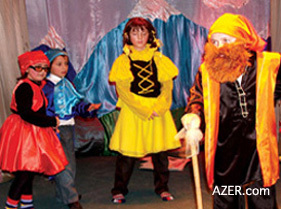 To give many children a chance to perform in Little Prince, five full sets of characters were created. Five Little Princes, five kings, five pilots, five sheep and five roses. Here, one of the Little Princes. Above left: Little girls decked out as Rose and Sheep in Little Prince. Above right: A visit to Japan in Heidi. 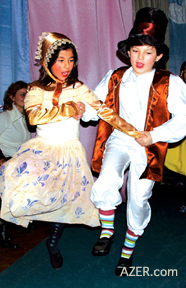 But for the children performing Little Prince, I just want them to have good associations. In the future, they'll return to it and understand that there can be many levels of meaning. I want them to think of Exupery's works as bright, not dark. Little Prince is really a story of love. And as such, it will give strength in times of doubt and difficulties. I want them to always remember profound lines such as: "It is only with the heart that one can see rightly; what is essential is invisible to the eye." I take it as the greatest compliment when people come to our performances and tell me afterwards that these children seem so normal and happy, and when they wonder why I say these children need psychological rehabilitation. Such words warm my heart because I'm the one who knows how much these children have come through and how much they have changed over time. Didi has made them stronger and happier. And this is something no one can ever take away from their hearts. 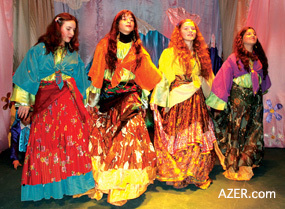 Above (left) Gypsy dancers in Heidi, (right) End of a successful presentation of Heidi. All the children who performed gather with Zara Imayeva, Director of Didi (wearing black in the center background). It's impossible to predict how one will react to severe trauma. For me, to escape such an abyss, I needed to draw upon strength outside of myself. My salvation came through Azerbaijani friends who believed in me and helped me get involved with helping others, who like me, had experienced too much pain. I wanted these young children to grow up to be healthy personalities, vivacious and strong. These friends helped me so much. They are to be credited with my recovery and the birth of Didi group - people like Rahman Badalov, Tarlan Gorchu, Ali Abbasov, and Vagif Ibrahimoghlu. I could never abandon these children now even if I wanted to. Not everybody is blessed with such dear relationships. It's like being drenched in a shower of golden rain.